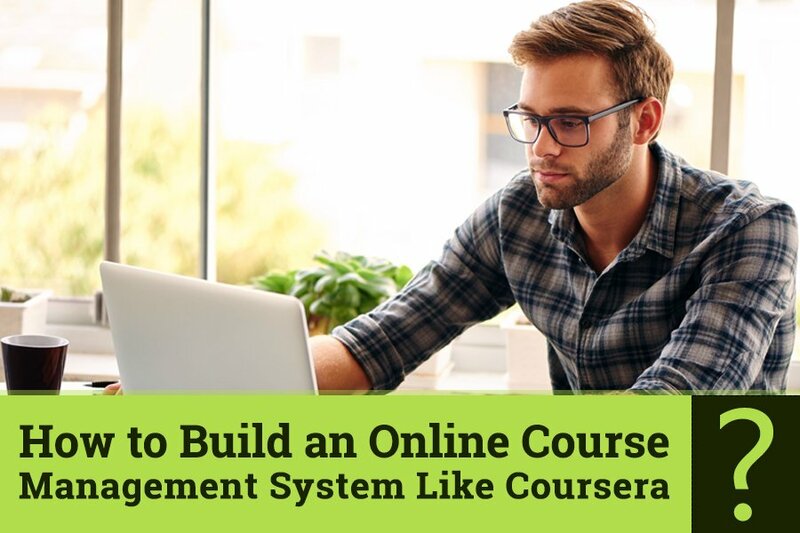 How to Build an Online Course Management System like Coursera? E-learning industry has become the undertone of education sector. As far as the education sector is concerned, e-learning is the fastest growing market. In 2015, e-learning industry was tagged at $56 billion. Today, it is valued at 100 billion of which, Course Management System market accounts for a little over $8 billion. The intensity at which it is increasing is exponential. As a part of employee training and conducive learning hours, most of the Fortune 500 companies use Course Management Systems. This not only facilitates knowledge transfer but also skill acquisition. No doubt, insightful and clever minds think of starting an online course management system like Coursera. Most of the courses in Coursera can be audited with e-learning CMS But the question is: How to build? Before answering the question, let me define Course Management System. Very simply put, a course management system is an aggregation of software tools that enable seamless management (planning, assessment and implementation) and delivery of informational courses in the form of resources to one and all. While administration and assessment features are integrated within a CMS (Course Management System), synchronous content management and authorization go hand-in-hand. Needless to say, classroom assessment techniques are leveraged, all thanks to the rich pedagogy of the instructors and tutors in the e learning CMS. Starting a robust and highly efficient CMS like Coursera can be an expensive proposition if not done the right way. Most importantly, you require tutors who are willing to vouch for your CMS. Gaining their trust is imperative when it comes to the course management software. Some of the costs are costs involved for licensing software, hardware and custom developments. Cost of ownership should be clearly defined. Ease of implementation is also another factor which cannot be disregarded in the e learning CMS. A good chunk of your investment will be allotted to this criterion. In the absence of sufficient bandwidth, your CMS may crash. This makes your instructors and registered participants extremely angry. They may never ever visit your CMS. We live in a digital world where cyber-crime and cyber theft seems to be indispensable. If your CMS doesn’t ensure privacy, safety and security, your prospects of winning and sustaining the trust of customers go for a big time toss. First of all, ensure that your payment system complies with the rules and regulations of Payment Card Industry (PCI). Regardless of the size of your CMS, abide by and adhere to what PCI says. Check for any existing vulnerabilities in your CMS. As far as financial information and data are concerned, privacy should be the dominant factor. Data Encryption technology should be leveraged. Data encryption technology ensures that sensitive information is not viewed by unauthorized parties. Moreover, the network in which transactions take place should be authorized and genuine. Otherwise, identity thefts surface. Safety login screens and terminals prevent security hacks. Most of the hackers are known to be efficient in contemporary and obsolete technologies. To stay ahead of the hackers and crackers, update your CMS to the latest and proven technology. It is highly unlikely that hackers may have superior expertise in the upcoming and trendy software. Integrate suitable security metrics. Do not let go of any loose ends. Loose ends may jeopardize the precious prospects of your CMS. Ensure that your servers are integrated with a secure SAN- Storage Area Network (SAN). All the participants should be able to access the authorized information through thin clients (of course, access is granted remotely). If anything, participants look for result-oriented training programs. All the courses and programs that you list on your CMS should meet industry expectations. In other words, if your courses do not match industry standards, no participant will be keen on your CMS. Two-way interaction is known to enhance participation of students with the course management software. To ensure effective and un-interruptive student-teacher interaction, an online chat tool should be used. To do away with any existing fears pertaining to loss of content, all the content should be stored in word documents. Word documents have auto-save feature. Thanks to the poka-yoke mechanisms, instructors will be prompted to save any unsaved information. No doubt, all the online classes should be conducted and organized by subject matter experts. However, 24/7 support is what students require. Always say ‘yes’ to on-demand support staff. While the aforementioned criteria are not exhaustive, it must have occurred to your mind that building an online course management system takes grit, determination, money, time, patience and persistence. This is where PinBoard comes into picture. Rather developing a CMS from scratch, you can always use turnkey CMS. Customize the layout, themes and design the CMS as per your whims and fancies. Ease of Maintenance: All the courses and programs run on server platforms on which the staff have excellent expertise. In case of any gaps, PinBoard admin team takes enough initiatives to bridge the gaps. Granular Administration: Granularity has everything associated with level of detail. Higher the level of detail, higher is the granularity. Granularity improves decision making. Granularity provides answers to questions such as- How many valuable hours does it take to monitor and maintain a particular course at server level? How many valuable hours does it take to monitor and maintain a particular course at program level? End user documentation: PinBoard CMS comes with a dedicated knowledge base section where all the required documents and material can be stored. Training guides and relevant content can also be stored here. Level of access to be granted to each and every user can also be effectively dealt with. For instance, you may provide read-only access to a few users. For others, you may provide both read and write privileges. Openness: PinBoard makes users experience and explore new domains. For instance, if a user intends to add a new module, he/she can do it without any second thought. However, he/she must adhere to clear-cut specifications. Standards and Compliance: Regardless of the size of the LMS, Pinboard adheres to specifications such as SCORM (Shareable Content Object Reference Model), IMS (Information Management System), OKI and AICC (Aviation Industry Computer-Based Training Committee). Scalability: PinBoard is perfectly scalable. Be it a small installment or a large one, PinBoard allows for the growth of content, users and functionality. Intellectual Property Security: This is the benchmark of a good CMS. While PinBoard is known to provide address all security concerns- financial and non-financial, it also provides the much needed intellectual property security. There are more than enough tools for Digital Rights Management (DRM). Requirements: Be it any client browser requirement or a server database requirement, PinBoard has is equipped with all the infrastructure. As a matter of fact, PinBoard has several software applications running seamlessly. Affordability: PinBoard is the most affordable course management system. We believe in bringing quality at genuine prices. If you have any questions, we have got answers. Feel free to drop a line or two in the comments section. Start your online course management system today. Cheers!